Our six Computer Science Fundamentals courses are designed to be flexible for your classroom. How you implement is up to you - teach CS Fundamentals for your next science unit, use it to support math concepts, add technology time to your schedule once a week, or go deeper with extension activities and projects! New to teaching computer science? No worries! Most of our teachers have never taught computer science before. Try one of our CS Fundamentals courses yourself to learn ahead of your students, or sign up for a professional development workshop near you! We offer high-quality, one-day workshops at no cost to you or your school. Join other teachers in your area for a hands-on and fun intro to teaching computer science. Our curriculum was created with the 2017 Computer Science Teachers Association (CSTA) standards in mind, but also includes opportunities to support national Math, English Language Arts, and Science standards. In fact, a recent research study found that classrooms with resourceful teachers see higher scores on English, math, and science standardized tests after teaching these lessons. 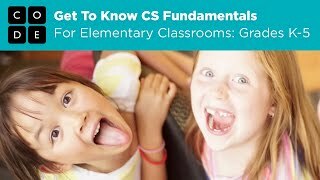 Click here to see how CS Fundamentals lessons support standards. The courses include daily lesson plans, student activities, and answer keys for teachers. You don't even need a user account to try it out. Once you get a feel for the courses, sign up as a teacher to see the lesson plans, join the teacher forums, and get access to all the resources you need. Next, quickly set up a classroom section from your roster or sync with tools like Clever or Google Classroom to view your students' progress and manage their accounts. Then celebrate your students' learning by printing certificates they can bring home when they finish the course. And, did we mention that it's fun!? Your students will create their own games, art, and digital stories that they can share - all while developing problem-solving, collaboration, persistence, and computational thinking skills. Do your students love to get up and move around? Half of the lessons are "unplugged" activities that teach computational thinking and digital citizenship skills without computers. See some awesome student creations below! In this puzzle, the student created a honeycomb pattern. This student created a game with multiple levels in which you play against different characters. Game on! This student created a Flappy Bird game. For students new to computer science, each course begins with a grade-appropriate entry point and structured ramp-up of concepts. The progression of Courses A-F builds upon each other to ensure continuing students stay interested and learn new things. This allows you to use the same course at any grade level for all students, regardless of their experience. If you’re looking for a more comprehensive course, the Express Course combines the best of Courses A-F into a single condensed course (with a simpler option for pre-readers). Explore the lesson plans and download the 2018 version of the curriculum guide for Courses A-F here. If you've been teaching Courses 1-4 and want to know how to transition to teaching Courses A-F, check out our Transition Guide. Teaches basic programming concepts such as loops and events. Lessons also teach students to collaborate with others meaningfully, investigate different problem-solving techniques, persist in the face of difficult tasks, and learn about internet safety. At the end of this course, students create their very own custom game or story they can share. Closely parallels Course A, but provides more complex unplugged activities and more variety in puzzles. Covers the basics of programming, collaboration techniques, investigation and critical thinking skills, persistence in the face of difficulty, and internet safety. At the end of this course, students create their very own custom game they can share. Students will create programs with loops and events. They will translate their initials into binary, investigate different problem-solving techniques, and discuss how to respond to cyberbullying. By the end of the course, students will create interactive games that they can share. Students develop their understanding of algorithms, nested loops, while loops, conditionals, and events. Beyond coding, students learn about digital citizenship. Students will practice coding with algorithms, loops, conditionals, and events before they are introduced to functions. In the second part of the course, students design and create a capstone project they can share. Students review the use of loops, events, functions, and conditionals before learning about variables and for loops. They will investigate helpful problem-solving techniques and discuss societal impacts of computing and the internet. In the second part of this course students design and create a capstone project they can share. CS Fundamentals Express combines the best of Courses A-F into a single condensed course (with a simpler option for pre-readers). We recommend Courses A-F for most classrooms, but if your school only offers one computer science course or you want to have your students work through multiple courses in a single year, the Express course is a better choice. By removing the ramp up between years, the express course provides a smoother path and doesn’t repeat concepts for students unnecessarily. This is also our recommended option for students studying computer science on their own, outside of a classroom. We are working on translating Courses A-F and the Express Course to languages beyond English. In the meantime, we recommend using Courses 1-4 and the Accelerated Course. These courses cover the same basic concepts and have already been translated into 25+ languages. If you don't have computers in your classroom, these unplugged lessons can either be used alone or with other computer science lessons on related concepts. BootUp PD FREE project-based, interest-driven K-6 teacher lesson plans featuring block-based programming languages in Scratch and ScratchJr. BootUp's entire curriculum, with 100 lesson plans, is FREE. 50+ hours of on-site professional development, model teaching, and coaching. Carnegie Learning Zulama is a standards-aligned K-12 curriculum that gives students a strong digital foundation. Students ideate, research, prototype, and program their own computational apps, games, and simulations. Our courses were written by faculty at Carnegie Mellon and MIT. All content is fully customizable, including assessments. Our content is rigorous yet fun, and includes assessments, lesson plans, and more. Included with student curriculum: Engaging, immersive, self-guided online professional learning courses that get teachers started on our platform; self-guided online tutorials that correspond to each student course; coding coaches are available through live chat during regular business hours (EST); online teachers forum, video library, and FAQs. Code Avengers Over 100 interactive junior lessons that teach computer science through storytelling. They weave in science, math and social studies to build broad and deep understanding of computational thinking and coding. $12.50 - $25/student. Bulk discounts available. Free onboarding PD session with any school license purchase. Self-directed professional development modules on how to teach computer science included with Teacher License. Additional PD Training Session USD $200 per teacher per half day session delivered via video conference. Code Monkey More than 10 game and project-based courses that teach text-based coding in CoffeeScript and Python. Includes freestyle game and challenge-creation platforms as well as game design, cross-curricular and Hour of Code courses. Complimentary demos and teacher resources (including fully-detailed lessons). Starts at $10/student. Bulk-discounts available. Complimentary demos, webinars, on-site visits (based on availability) and MOOC instructor course available with subscription. Codesters 3-lesson intro and project platform, FREE, 2 40-hr Intro. to Python courses and a 20-hr Intro to Game Design course, $20/student for the bundle (Python 1, Python 2, and Game Design) or a la carte pricing FREE 30 min. teacher webinars, Half day, 1-day, and 3-day workshops available, $500-$2,000 per teacher depending on length and location. Parallax Inc. Pre-programmed and re-programmable educational robot that fits into a wide variety of program formats. Uses the visual BlocklyProp programming tool. Curriculum is FREE. Robot purchase required. FREE in-person immersive single day trainings. Occasional live webinars. UC Davis C-STEM Center Integrating coding into math education. Coding, robotics, math activities, and teaching resources for grades 1-6. Coding in Blockly and user-friendly C/C++ Interpreter Ch. Free teaching resources available including PDF textbooks. School site licenses $600. Nearly 100 free interactive and video tutorials. $150/day training held at UC Davis campus and nationwide. Costs vary for custom-tailored on-site training.